Nestled away between a garden, another building, and a courtyard, Old St Joseph’s is the oldest Catholic parish in Philadelphia, founded in 1733. 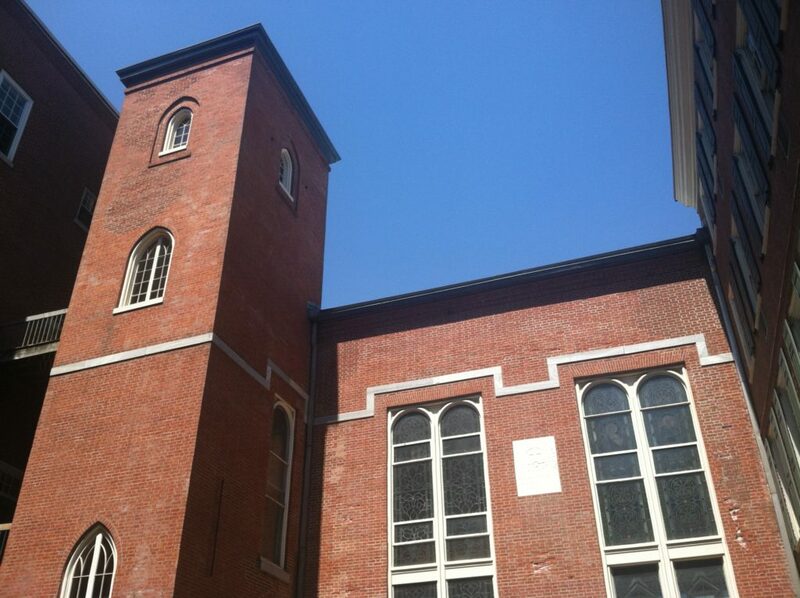 The current building dates from 1839, still among Philly’s oldest churches. The building’s unusual position in a courtyard may be due to strong anti-Catholic sentiment in early Philadelphia. In 1734, the right for Catholics to worship in the church was challenged, but ultimately protected under William Penn’s Charter of Privileges, which grants freedom of religion for all faiths in Pennsylvania. Legend has it that Benjamin Franklin advised Father Greaton, the church’s founder, to keep the church away from the street due to this sentiment. Most of the church’s exterior is covered by surrounding buildings, and there is a simple bell tower within the courtyard. The interior differs greatly from others in historic Philadelphia in that it’s painted. It has a rather interesting yellow color scheme on the walls and ceiling. The ceiling has a fresco titled The Exaltation of St. Joseph into Heaven, by Italian artist Filippo Costaggini. There is a painting of the Crucifixion over the altar. It has a curved balcony, meaning that parts of it come close to the altar. The organ appears to be done in a more Gothic style, in contrast to the rest of the interior. There are a few stained glass windows, with some using a pattern-based design and some using a more pictorial style.